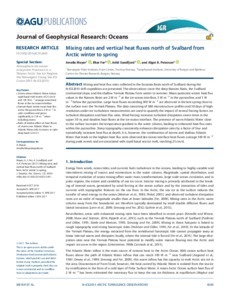 Mixing and heat flux rates collected in the Eurasian Basin north of Svalbard during the N‐ICE2015 drift expedition are presented. The observations cover the deep Nansen Basin, the Svalbard continental slope, and the shallow Yermak Plateau from winter to summer. Mean quiescent winter heat flux values in the Nansen Basin are 2 W m−2 at the ice‐ocean interface, 3 W m−2 in the pycnocline, and 1 W m−2 below the pycnocline. Large heat fluxes exceeding 300 W m−2 are observed in the late spring close to the surface over the Yermak Plateau. The data consisting of 588 microstructure profiles and 50 days of high‐resolution under‐ice turbulence measurements are used to quantify the impact of several forcing factors on turbulent dissipation and heat flux rates. Wind forcing increases turbulent dissipation seven times in the upper 50 m, and doubles heat fluxes at the ice‐ocean interface. The presence of warm Atlantic Water close to the surface increases the temperature gradient in the water column, leading to enhanced heat flux rates within the pycnocline. Steep topography consistently enhances dissipation rates by a factor of four and episodically increases heat flux at depth. It is, however, the combination of storms and shallow Atlantic Water that leads to the highest heat flux rates observed: ice‐ocean interface heat fluxes average 100 W m−2 during peak events and are associated with rapid basal sea ice melt, reaching 25 cm/d.